The phrase “a picture tells a thousand words” really does ring true in the high-pressured environment of responding to a large scale flooding event. That’s why new technologies that allow our staff in an incident room to see what’s happening on the ground are proving invaluable in helping us respond faster and better when floods threaten. 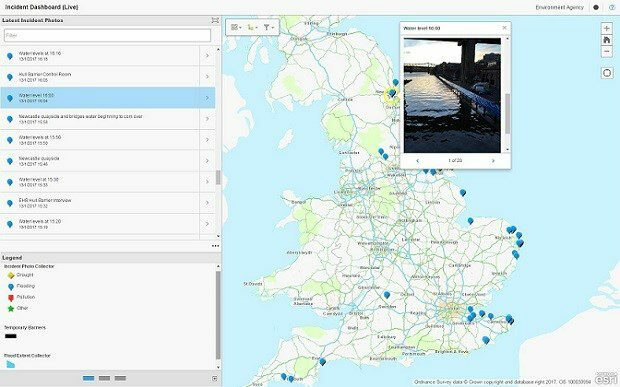 Released at the end of 2016, we have a new mapping system that’s revolutionised the way we respond to incidents. It’s called the Incident Management Portal (IM Portal) – and it lets us capture and share real-time data from the field using iPads, smartphones and other kinds of mobile technology. Over the past year I’ve been involved in developing exciting technological innovations to improve the way we respond to major flooding and environmental incidents, including the use of smartphones. This was first trialled in our West Midlands area in early October 2016, and after a positive response, has been rolled out across the country. Now, our staff on the ground in an incident can use a mobile app which lets them instantly relay location-tagged images and videos with critical information, helping us better understand the situation on the ground. 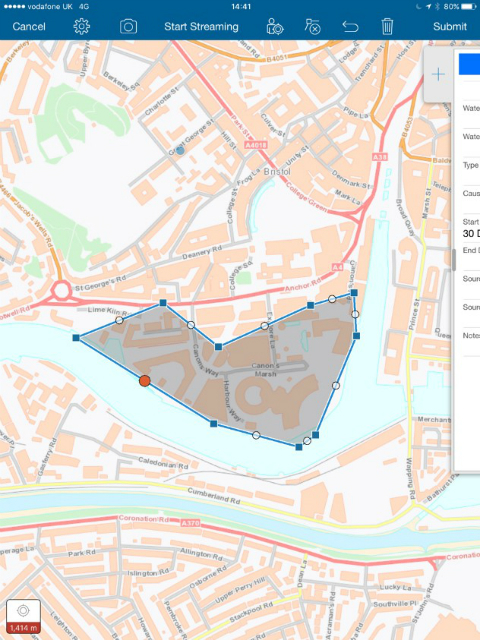 But it’s not just about photos and videos – our teams can use tablets to instantly map flooded locations, as shown on this example map (pictured left). Once captured by our teams on the ground, our teams in the incident room can use it to assess the scale of the flooding and efficiently deploy extra resources to the locations affected. We put this technology to its first major test during the East Coast surge. Environment Agency staff at 90 locations up and down the country – from Newcastle to Penzance – were capturing the event live (pictured below). Our teams in the incident room got the most up-to-date, time-critical information possible, which let us see in close to real time what the effects were on the ground. Using this information along with our existing telemetry systems we could continually assess how events were unfolding and make fully-informed decisions about having the right people and equipment in the right places. But we’re not just using these tools during a flood – even after, we can use the data collected by comparing it with our forecast models. Essentially, this allows us to play back the incident to see how it unfolded and improve our modelling so we can do an even better job next time. It’s just one example of how we’re using new technology to better predict and respond to flooding – technology that we didn’t have even a decade ago, when, during the summer of 2007, record-setting rainfall saw more than 55,000 homes flooded in areas around the country. But since then, we’ve also started using airplanes, remote-controlled boats and light detection and ranging (LIDAR) technology to map the depths and shape of river beds and to monitor the condition of our flood defences. During incidents we can even use drones to check flood defences and confirm the extent of any flooding. Plus, we now have four state-of-the-art incident command vehicles than can coordinate our response on the ground with our response in the national command centre. It’s all part of our efforts to get better at predicting, responding to and minimising the impact of flooding on people, homes and businesses – and the future will see us continuing to innovate. This is a fantastic use of technology. The replay mode will certainly allow you to tackle floods in future. Congrats to all involved. We've just updated our tech too and have created http://www.spillkitdirect.com we are trying to make it a valuable resource for people trying to understand their responsibilities around spillage as well as service their need. Do you have any resources you could share with us?